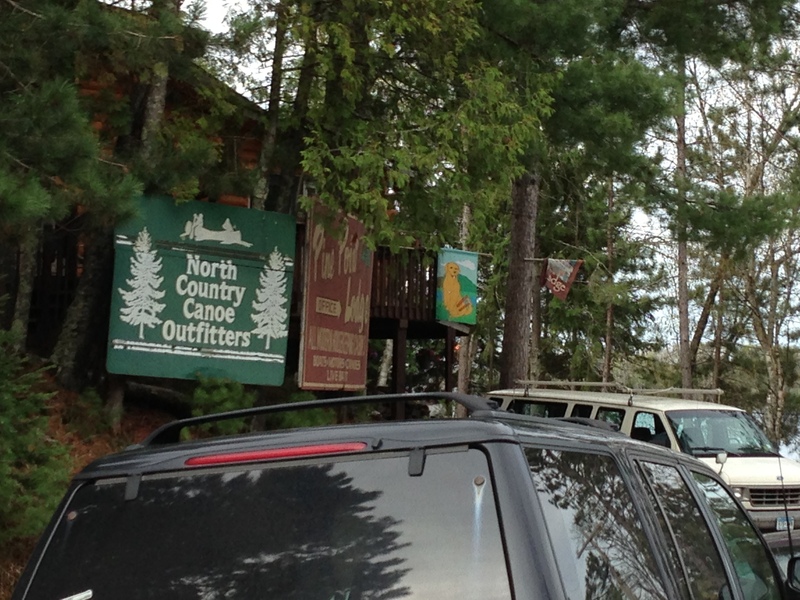 Friday, May 24- From Two Inlets Resort to Ely, Mn. 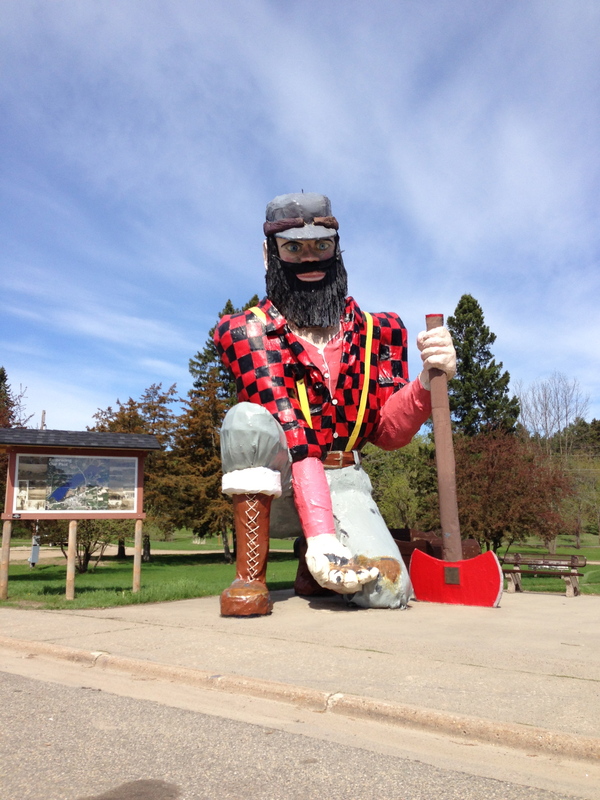 I love driving through the small towns and then come upon something quirky like Paul Bunyan. 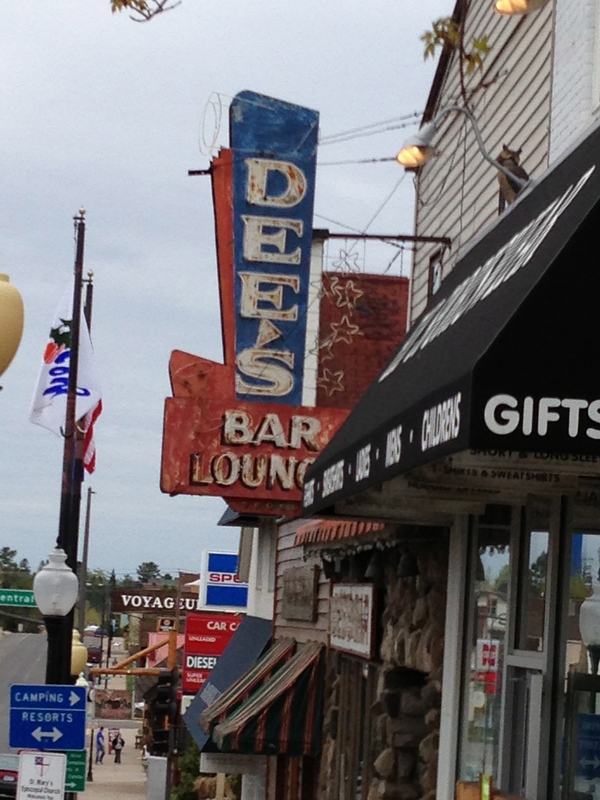 To get to Ely from Park Rapids, is to drive through the heart of Minnesota’s mining district. 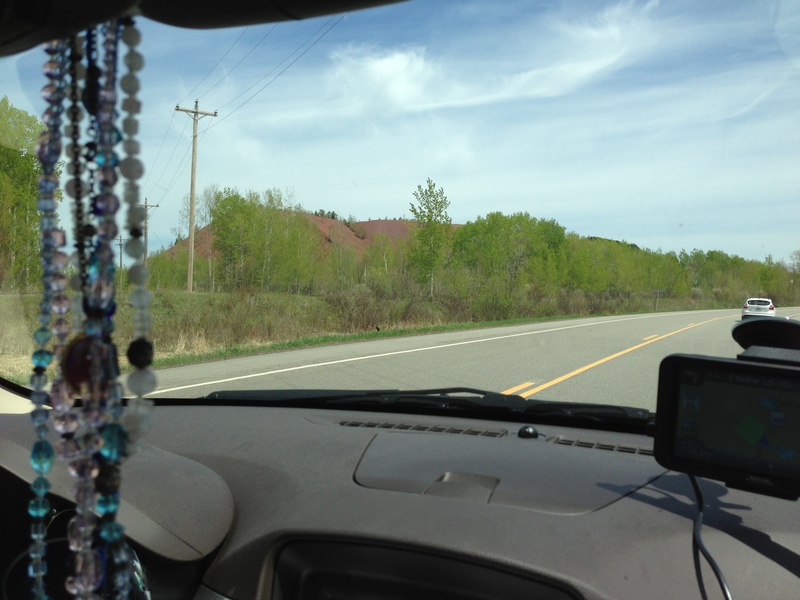 Hills of red dirt made by man lined the highway. Beside the hills are reservoirs,, created from the abandoned mines, themselves. When I think of mines, I think of old prospectors or coal streaked men crawling around underground. These mines were huge productions, revolving around digging ginormous holes.…going for the taconite, an iron ore that’s a key ingredient for steel. Here’s a link that tells you all about it if you’re interested. All I can say is that it certainly disrupts the landscape. And all I could think about were Ayn Rand books. I think Howard Rorack was working in the stone quarries around here in The Fountainhead. And then there was Hank Rearden of Rearden Steel in Atlas Shrugged. So as we were driving through the mining country, I just was remembering stories. Ai!Yi!Yi! Were we that obvious? 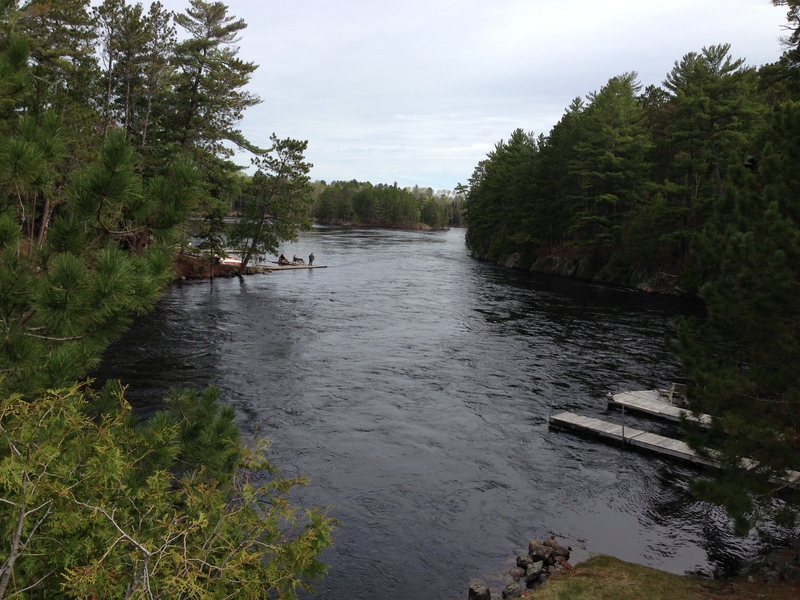 Ten miles down this river is Canada and thousands of lakes to explore. We wanted to take a canoe and do just that. and the North American Bear Center. The three ambassador bears weren’t in their two acre playground because of some construction, but we were taken back behind the scenes to watch the bears taking their baths. I learned so much about the wolves and the bears. We must have spent a couple of hours at both places. And I’m planning to visit their websites to keep learning. Fascinating. One thing that I learned is if you are non-threatening with a black bear and don’t try to take it’s food or it’s cubs, it pretty much leaves you alone. When it is scared, it will charge, but if you are brave enough (and I wouldn’t be) to remain calm, the charge will stop several feet away from you, and the bear will move on. The bear, above, was really sweet. He would “kiss” the woman’s hands by licking them because the bath was feeling so good. However, when it came to feeding time, there was one person who distracted the bear with treats and another who opened the cage and put the food inside. In other words, nobody took any chances with this gentleman. All three of the ambassador bears had been raised in captivity and would not do well in the wild. Same went for the wolves. They would introduce only two pups every four years into their ambassador pack. Since the wolves were contained, and the alphas, when challenged, had no place to go, the Institute would “retire” the older wolves so that there would be no challenges and deaths. There are currently three retired wolves. One, the oldest, lives alone, and the other two–litter mates and lovely and white, lived together. 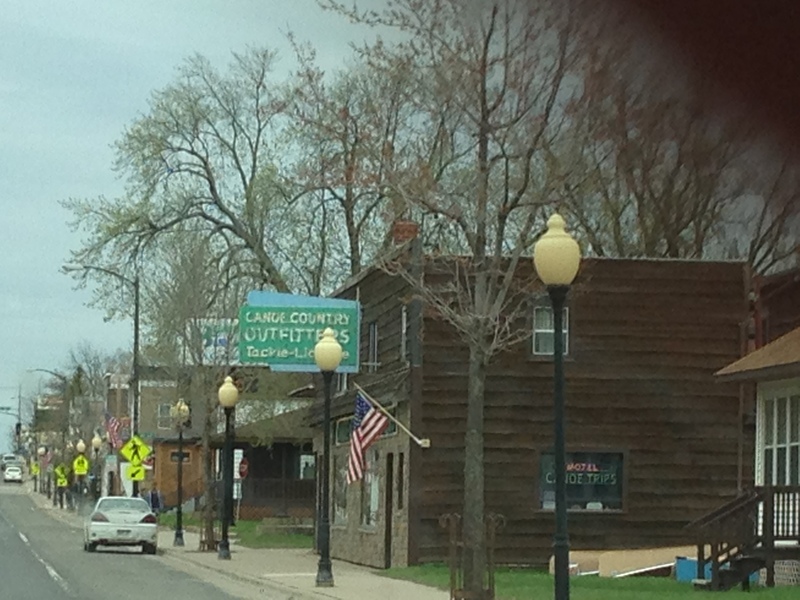 And here’s one more look at downtown Ely, a town, I was told that is always active with tourists all year long. In the summer, it’s canoeing and fishing. In the winter, it’s sled dog racing, snow shoeing and cross country skiing. And, of course, ice fishing. I loved the energy of the place. So active and curious and tinged with adventure. Currently, we are in the Minneapolis area visiting. Spent a wonderful day exploring a park at Taylor’s Falls with a good friend. We’ll be heading home on Thursday, and I’ll continue with my Chronicles at that time…. Okay, now I get it about Ely! 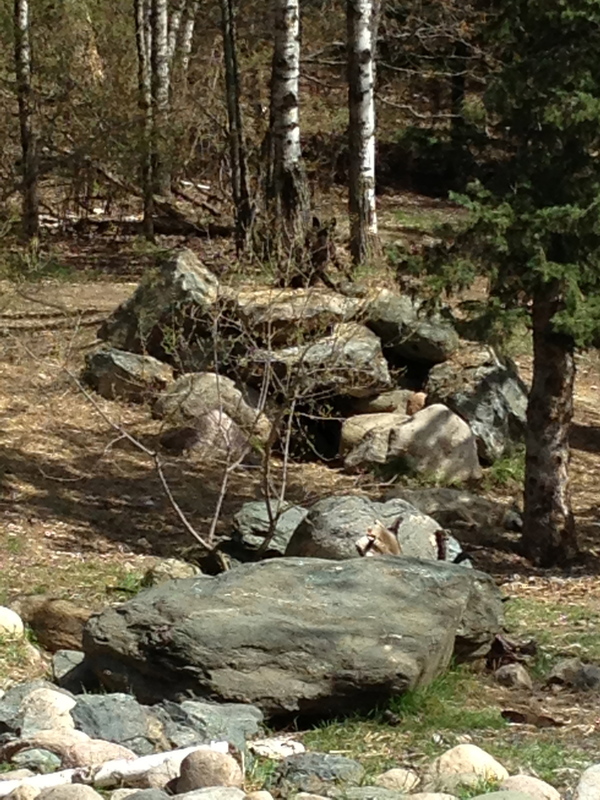 And I could only find two wolves, the black one, and one snoozing in the shade near the foreground. You getting ready to join me in my sacred pastime of wildlife protection activist emails and calls? Just say the word! Wolves need help at the moment. And here’s the link to the North American Bear Center. I’ve become a member of each. Just so you know the arctic wolves are the oldest (Shadow and Malik) and the one by itself (Grizzer) is younger and it’s called the International Wolf Center. THank you! I like to get my facts right. Grizzer has a litter made, does he not? I did not see him. Grizzer had a sister but she had to be put down because she spiral fractured her leg one night and they didn’t want her running around with only 3 legs with the pups being as rough as they are. That’s too bad. I recently began volunteering at our local wildlife rehab fasciity and am learning that sometimes that’s the only choice you’ve got and the most humane. It’s still saddens me, to.